It was the fifth act of terror in the country in less than a year, and Riddell was anxious for more information. Combing through social media looking for real-time updates, she came across the image of a burning white plastic bucket. Riddell told herself that she'd read the parts about the music halls and skip the campaigning parts. She was presented with two folders' worth of handwritten papers. About five pages in, Riddell says, an incredible voice leapt off the page. She was reading the words of a suffragette who talked openly about staging arson attacks. Other papers indicate she was also a bomber. In other words, says Riddell, she was "a terrorist". "Through the pages Kitty was a such a powerful speaker. And she was telling me a violent story that I had never heard. Later I checked with my friends, my family, and even other academics I knew. They had never heard this either. This was a part of our history that most historians seemed to have shied away from exploring, and here I was with access to a primary source, a woman who was unlike anyone I had encountered in the history books." She calls it a Da Vinci Code moment. Riddell stayed in the archive until it closed, reading the story of Kitty Marion in one sitting. Katherina Maria Schafer had arrived in London at the age of 15 after fleeing from her abusive home in Germany. Her mother had died when she was an infant, leaving her alone with a violent and unloving father. He killed her puppy when it began to show her affection. She lived with her aunt, uncle and cousins in east London, and quickly learned English. By chance, she stumbled into the energetic and vibrant world of music halls and for the first time, the teenager felt a sense of belonging. She renamed herself Kitty Marion and began a career as an actress and dancer. "Kitty was mesmerised by this world," says Riddell. "Music halls were an exciting and cosmopolitan pocket of Victorian London. Working, financially solvent women and interracial marriages were common here. Kitty had a diverse group of friends - the son of a Chinese diplomat gave her her first cigarette. She forged fast friendships with women - strong, sexually liberated women unlike those I had read about in the history books. Women in Victorian England were generally depicted as long-suffering pious victims, not the free agents I was meeting in Kitty's autobiography." Marion didn't immediately champion the cause of gender equality or votes for women, but then, as Riddell puts it, "she had a Me Too moment". An assault by a music hall agent, whom she refers to only as "Mr Dreck" or Mr Trash, made Marion seriously question a career in an industry dominated by powerful men. In her autobiography she describes how her "whole being revolted" at the incident. "Few women forget the first time they have been assaulted. The first time someone has decided that they have the right to touch, to kiss, to take without asking," says Riddell. As a travelling actress, Marion saw that she was far from alone in having to endure such an experience. Suffragists or suffragettes - who won women the vote? What did the suffragettes do for you? "It was the idea that women deserved a right to be safe in their working environments, and to have their independence without having to sacrifice their bodies to get it, that propelled Kitty into the fold of the suffragette movement," Riddell says. 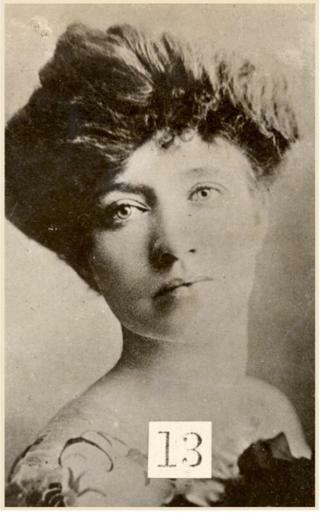 Marion joined the Actress Franchise League, which often staged pro-suffragette plays. After that she joined the Pankhursts' Women's Social and Political Union and soon began to participate in demonstrations and marches, graduating later to radical acts of civil disobedience. Her first experience of prison came after she threw a brick through a Newcastle post office window, and, like an increasing number of jailed suffragettes, she went on hunger strike. The prison authorities dealt with these women by force-feeding them - violently pushing a tube into the nose or mouth. 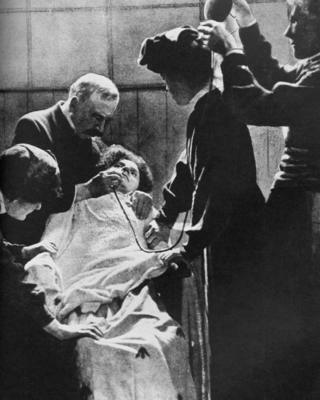 Marion protested against this first treatment by breaking a gas lamp and using mattress stuffing to set her cell on fire. Repeated imprisonments followed, mainly for arson attacks. On the night of 13 June 1913, she and a fellow suffragette set fire to a racecourse grandstand in retaliation for the death of Emily Wilding Davison, who had died after being trampled by King George V's horse during a protest at the Epsom Derby. Both were arrested the following morning. This time she was force-fed an excruciating 232 times in one day. Riddell was entranced by Kitty Marion. Here was a woman who was not a household name, but was certainly a frontline soldier in the suffragette movement, and well-known to its leaders. Riddell spent hours, then days, months and eventually years, looking through huge amounts of archival documents including personal diaries, letters, court and police records, published memoirs, and newspapers to piece together Marion's life in the movement. A little-known history of the suffragettes began to emerge. They were not just breaking windows or committing arson attacks. The women sent vials of phosphorus in the post, which would break when handled, causing postmen to suffer severe burns. They were also planting bombs. "By the start of 1913, the suffragettes had become a highly organised terror group," argues Riddell. "In May 1913 there were 52 attacks, including 29 bombs and 15 arson attacks in the country." Home-made bombs, much like the one that Riddell had seen on social media following London's Parson's Green attack, were found in churches, packed train carriages, halls and stations, and Riddell says that they were intended to hurt people. It was pure luck that they didn't. "Bombs then did not detonate instantly like they do now, they fizzed and spluttered and smoked, and gave people plenty of time to get away. But they were placed in public places, with large footfall. 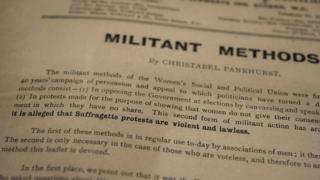 In pamphlets suffragette leader Emmeline Pankhurst called the militancy "continued, destructive guerrilla warfare against the Government". Both suffragettes and the police called it a "Reign of Terror". Newspaper headlines referred to "Suffragette Terrorism". "There is no doubt that this had all the hallmarks of what we would today define as terrorism," says Riddell. While Kitty Marion is frank about her arson attacks, she is coy about the bombs. 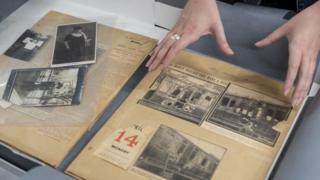 She kept a scrapbook of clippings of arson attacks that she carried out - and included reports of bombings where the attacker is not identified. Riddell believes Kitty is claiming responsibility for these attacks. There are also revealing letters from one suffragette to another. There is some indication, Riddell adds, that the suffragettes made a co-ordinated attempt in later years to remove references to their most violent acts from published memoirs. 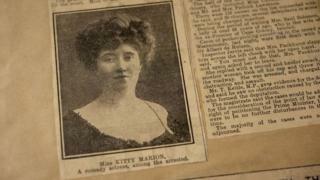 When Riddell began to speak out publicly about Kitty Marion's violent record she faced some backlash from suffragette historians. "One wrote a letter saying my research was 'shameful' and I should 'not continue', which was incredibly intimidating for me, a young student at the start of my career," says Riddell. "Other historians were defensive, saying that there was no large whitewashing of suffragette memory. To that I'd like to address people who aren't in the elite academic bubble, 'Have you or your friends heard of suffragette bombers? Have you ever heard them called terrorists?'" Riddell says that it was only the outbreak of World War One in 1914 that curbed the escalating militancy of the suffragettes. Kitty Marion's final arrest in the UK came the year before, on suspicion of setting fire to the grandstand at Hurst Park racecourse, near London. She was sentenced to three years in prison, of which she served several months before being released to a hospital under the provisions of the so-called Cat and Mouse Act (which allowed for the early release of prisoners who were so weakened by hunger strikes that they were at risk of death - though they were recalled to prison once their health improved). Following the outbreak of World War One the British government seized the opportunity, Riddell says, to accuse one of the most dangerous women in the suffragette movement of being a German spy. But Marion had loyal friends, and a number of high-profile suffragettes helped her travel to the US instead of returning to prison. While in New York, the itch for social justice returned. Kitty Marion made friends with Margaret Sanger and became involved with her American Birth Control movement - which went on to become Planned Parenthood. "Here was a woman whose life linked two of the great movements of our times, and yet we don't know her name," says Riddell. 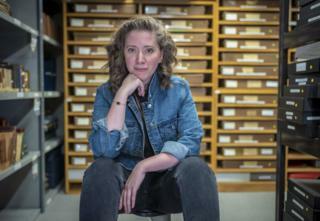 The research Riddell carried out for her PhD became the basis of her recently published book, Death in Ten Minutes. This has been optioned as a drama series detailing the lives of Marion and her friends - a group within the suffragette movement who called themselves The Young Hot Bloods whom Riddell accuses of carrying out bomb attacks. Riddell is keen to make clear that she is not trying to tarnish the reputation of the suffragettes. "I am so in awe of these women," she says. "But we cannot shy away from what these women were in their entirety. There's an age-old saying, 'One man's terrorist is another man's freedom fighter.' That is the same here." 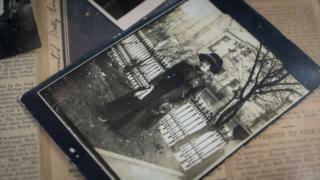 Riddell keeps a photo of Kitty Marion in her home. "Kitty desperately wanted her story to be told and I'm so proud to finally be able to do that for her," she says. "Everyone should know what difficult, troubling choices these women made for us to be free." These women staged headline-grabbing stunts, chaining themselves to railings and attacking property. Yet they risked turning the press and public against their cause. Would their tactics prove effective when war was looming? Did the suffragettes win women the vote?